Eight years ago I received a free tower and rotator. I’ll write about the rotator in another installment but I’ve since discovered that some ‘free’ ham gear is like being given a free dog… you have to be aware of the hidden costs. I had never had a tower but always wanted one. I’d been satisfied with my Carolina Windom, an off-centre fed dipole at 25 feet off the ground, that let me use most HF bands right up to 80m. It served me well, and still does but greater involvement in contesting and the desire to move up to a more directional antenna encouraged me to make the move. Fortunately I have a wife who is also a ham, though not particularly active, but she knows the thrill I get when working a new country or breaking through a pile-up. She was supportive in my quest. Coincidentally I also had to replace the deck on our 30 year-old house. That provided another incentive to get the project started and find the right location. Our old laundry line was accessible from the deck at a corner of the house. The new deck, with glass panels around it would no longer allow this so the new tower would have to do double-duty as the anchor for the clothesline as well. I decided that it would be a light-duty tower as I didn’t have the space for a full-size tower, and I wanted to keep peace with my neighbours. I spread the word among my fellow club members that I was looking. Pretty soon an offer came in of five ten-foot sections of light duty tower. I picked them up and it was immediately evident that some work would be needed before they would be safe and usable. Thick rust had eaten though much off the galvanized surface. 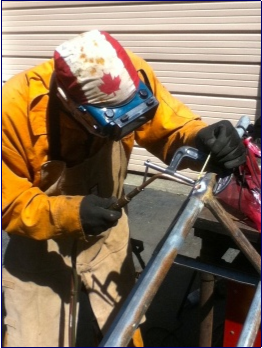 Several of the cross-member welds had broken and one section was noticeably bent. I knew my wife wouldn’t be pleased. Over the next several days I spent time washing down my new acquisition, which had evidently spent time behind someone’s shed, judging by the weeds, caked mud and dead critters in and outside the tubing. I also spent some Internet time researching whether I could revitalize this tower and how to go about it. My daughter-in-law manages a paint store and was able to provide me with some technical advice on surface preparation and coatings. I knew I would have to paint the sections for my wife to accept them right outside her kitchen window. Colour would also be a factor. I bought two brass wire wheels and some emery paper and set to work to clean off as much loose rust as I could with my power drill. It worked well and a day later I was done. Based on my Internet findings, and helpful reviews by previous users, I tried three products to tackle the remaining rust. 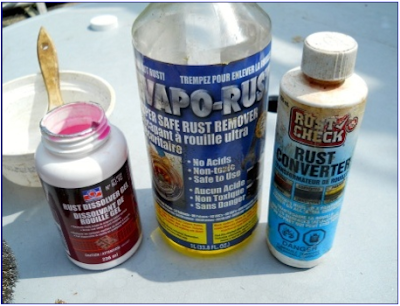 From left to right on the photo below they were Permatex brand ‘Rust Dissolving Gel’, ‘Evapo-Rust’ by Rust-stop Canada, and Rust Check brand ‘Rust Converter’. All were applied according to the provided directions and they performed their intended function. The gel, being thicker, clung to the parts better but was much slower and required a lot of re-coating to keep working. The other two products were thinner and more difficult to keep in place, but they produced faster results. 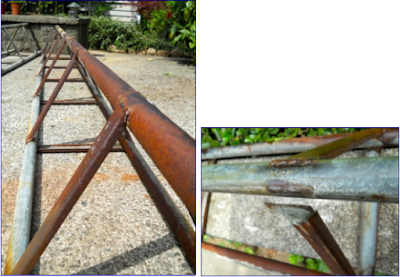 If these were small pieces that could be submerged it would be no contest but keeping to a short section at a time and using a paint brush to keep the area wet with solution clearly showed the Evapo-Rust product to be the most suitable, and the fastest. It also appears to be the most environmentally friendly of the three, though I wouldn't recommend doing this job on your lawn, as I started to do. Yes, the grass did eventually grow back. The surface was now free of rust and, after another scrub, was ready for inspection. I looked closely at each cross-tie and at every weld. Suspicious ones were marked. Several were obviously cracked or already split. With the assistance of Fred Orsetti VE7IO, the welds were repaired. I was ready for paint! I would have used an oil based primer and top-coat but my expert advised me against it and she was correct. According to the product sheets for such coatings, it is not recommended that you use an oil based product on galvanized surfaces. The paint will release and peel off after a time—and I didn’t fancy the thought of doing this again in a couple of years. There are special coatings available in a spray can specifically for galvanized metal but they are quite expensive with low coverage, exacerbated by the necessity to get inside and out and into all the nooks and crannies around the welds. I decided a brush was the better applicator for that job. We (read in wife-approval mandatory) decided the least noticeable colour on our wooded lot would be a camouflage green. As a result of my ‘colour-Googling’ I had actually suggested a multi-colour camo paint scheme but that was vetoed as being too ‘military looking’, and so the appropriate latex primer and top-coat were tinted. 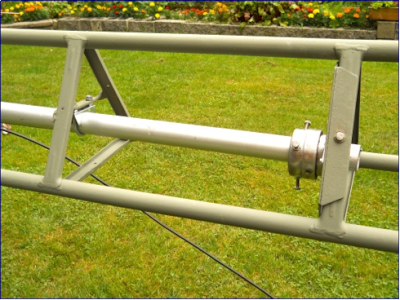 It took exactly one litre each of primer and top coat to paint the five sections twice, with extra coatings on the welds. I used an air sprayer on the legs for the final coat. Next came even tougher work. 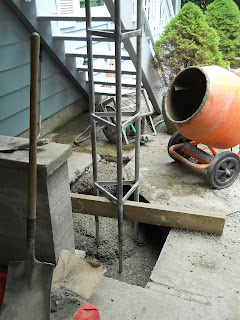 I had to remove a section of my cement patio to make the appropriate foundation and dig a big hole. There were brackets available that could be surface mounted but I’m a ‘belt and suspenders’ kind of guy and I wanted this thing in a block of concrete. I used 3 thick reinforcing rods and placed the first tower section over the top. If guys are not used, the tower manufacturer recommends fastening a section to the house as high up as possible, in my case that was just near the top of the 2nd section. I visited my local scrap yard and purchased some heavy-duty angle aluminum by the pound. I cut pieces to make an equilateral triangle and bolted one to the top plate of the house, running two arms to adjacent tower legs where they were secured by U-bolts. It’s steady as a rock. I used stainless steel hardware for all the section to section connectors in case I ever want (or have to) take it apart. 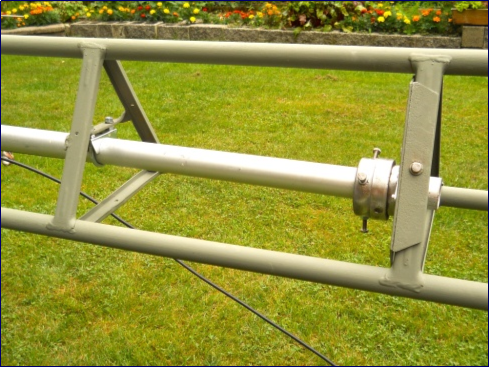 That time is approaching as I have completed a rebuild of a rotator and HF yagi that will go up the following spring. It has now been over 7 years and the tower shows no signs of either rust or paint failure through hot summers, cold winters and deluges of rain. It was a lot of effort but I’m pleased I did it. Even with my Carolina Windom centered at the top of the tower, much higher than before, I’m getting much more activity across all the bands. The sections above the roof blend in nicely with the trees. 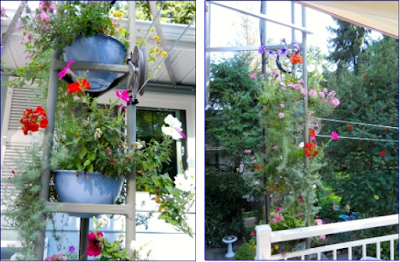 The final touch was to place flower baskets on the rungs at each level. My XYL now refer to it as the ‘Tower of Flower’ and surprise… the neighbours even say it looks good. A Triplexer... What is that?